Heritage and history are very much part of the tradition of Freemasonry which is based on legends that date back to the time of the construction of King Solomon�s Temple. Of the many great buildings erected by the masons in the Middle Ages, attention has focused on the great cathedrals throughout Europe. The North Munster Masonic Centre in Limerick is located in the midst of the tourist and heritage area of the city, directly across the road from King John�s Castle and beside the former Bishop's Lady's Palace (now the headquarters of Limerick Civic Trust). The Jim Kemmy Limerick City Museum is also nearby, as is the Hunt Museum. One of the many features of our museum is a reconstructed portion in similar stonework of the original wall of the coach house and stable used by the Bishop of Limerick in the 1740's. Some other parts of the original building have also been retained in the museum area. 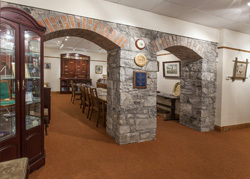 The North Munster Masonic Centre in Limerick greatly welcomed a grant from Shannon Development under their Tourism & Heritage Innovation Programme, and this enabled them to complete the museum and library area at the North Munster Masonic Centre which is open to the public by prior arrangement. To make an arrangement please follow the e-mail link below. Alternatively, please contact Limerick Civic Trust who are organising guided tours for groups (see below). One of the artefacts in which the Freemasons of North Munster take great pride is the ancient brass square known as the �Baal's Bridge Square�. A replica of this takes pride of place among the exhibits in the museum. The original brass square was recovered from the foundations of Baal's Bridge in Limerick when the bridge was being rebuilt in 1830. It is inscribed �I will strive to live with Love & Care Upon the level By the Square� and bears the date, 1507. This Square is reputed to be one of the earliest Masonic items found in the world. A limited edition of 500 replicas in �distressed� silver, hallmarked and numbered, was struck from a mould taken from the original and each comes in a presentation box accompanied by a certificate of provenance together with a history of the artefact. The replicas were made to commemorate the 160th Anniversary of the founding of the Provincial Grand Lodge of North Munster in 1842. The proceeds have been going towards the Masonic Centre just across the road from King John�s Castle in the old City overlooking the River Shannon a mere 500 metres from where the Square was originally discovered in 1830. We now have only a limited stock of replicas and regretfully the price has risen to �250.00. Should you wish to purchase a replica, please send an e-mail by clicking here. Click here for more information on the Baal's Bridge Square. Guided tours of the Masonic Centre, including the Museum, are now being arranged, for groups, by Limerick Civic Trust who may be contacted at 061 31 33 99.